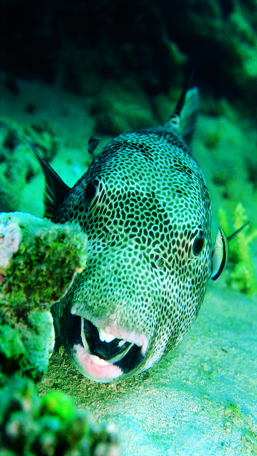 Surprising, this fascinating and wonderful underwater world that hosts wildlife of extraordinary richness. Let’s discover these species of shapes, colors and with different ways of life. 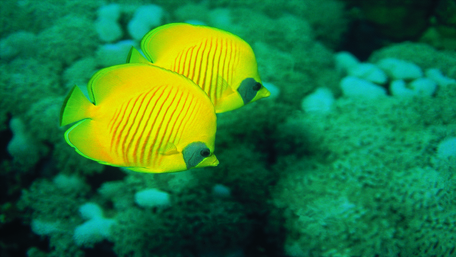 The Sea Butterfly is one of the most recognizable species of the Red Sea with its yellow color that attracts divers. 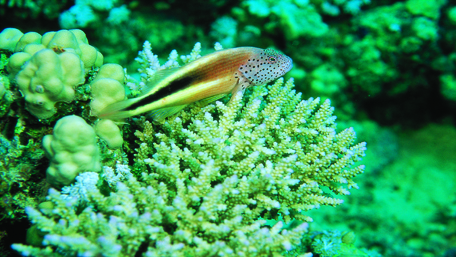 Living in pairs or groups, this fish is more active in late afternoon and eats coral polyps. 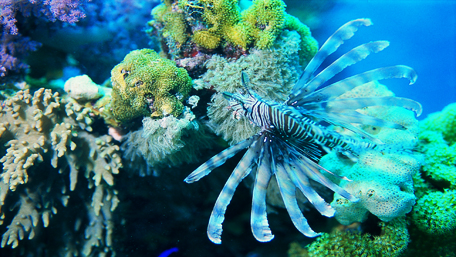 The rest of the time, it hides safely under corals to avoid predators. Bench of mackerel or big eye trevally. 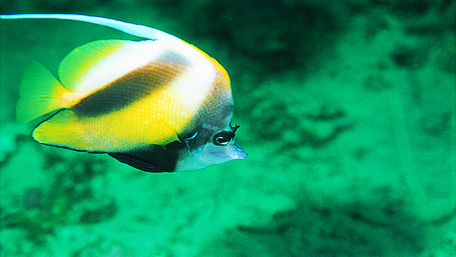 These fish live in groups of several hundred individuals in deep lagoons (up to 90m). Impressive sight: the sudden change of formation of the group, giving the spectator extraordinary shows. Mackerel move from one reef to another in search of food, small coral fish. 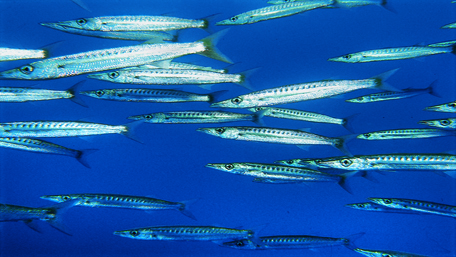 Blackfin barracuda is the most common in the region. 130cm long, it waits patiently for the sunset to go hunting for fish. 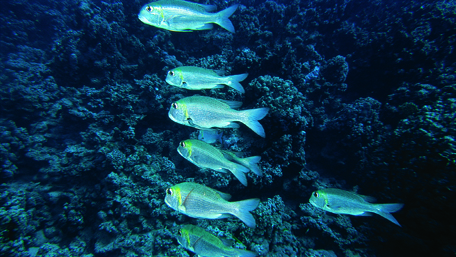 Living in small groups, bigeye emperors live in sandy areas of the Red Sea. 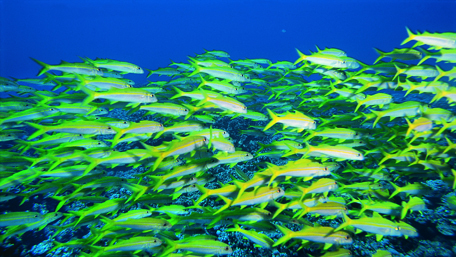 These mulloides vanicolensis or yellowfin goatfish (family of mullets) live in groups of two hundred. 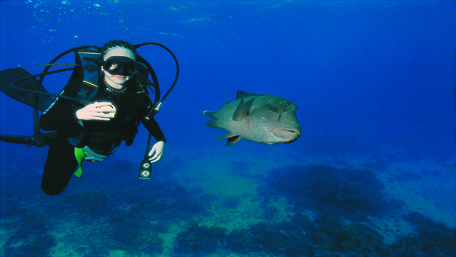 It is not uncommon to see them with other species such as snappers. Amphiprion bicinctus, two band anemone fish or Nemo for short. 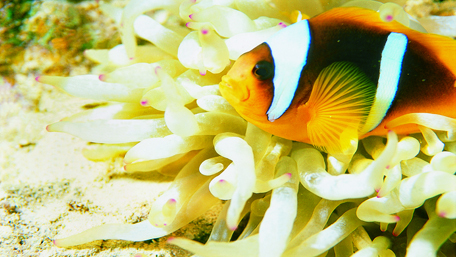 Sole representative of the family of damsel fishes in the Red Sea, this clown fish hides in the tentacles of anemones that protect it against hungry predators. Despite its eleven cms long only, adult fiercely defends its territory. 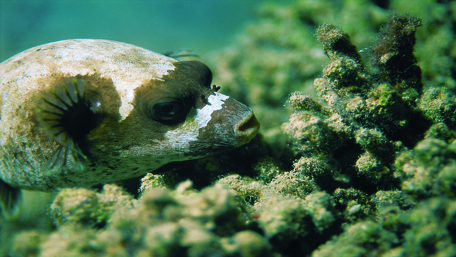 The masked puffer belongs to the family of moonfish. At the slightest danger, it inflates its stomach bag to frighten intruders. Rather living alone, the arothron diadematus only joins large groups in periods of mating. 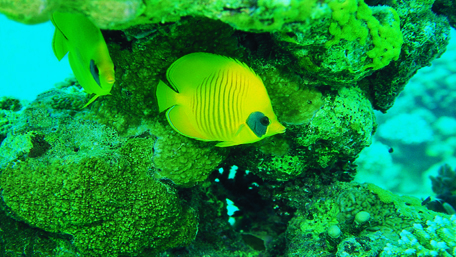 The Red Sea bannerfish, endemic to the Red Sea, like to swim along the coral reefs. They feed on plankton and small invertebrates. Do not be fooled by appearances, these fish are very territorial desperate to prevent intruders too curious to approach their “domain”. There are at least a hundred species. Some are equipped with a long “nose”, others with a rounded form, but all have beautifully colored skin. A real natural masterpiece. 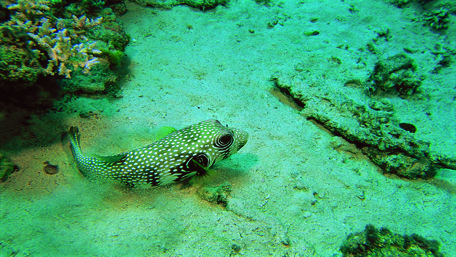 The Foster’s hawk fish are widespread in the Red Sea and the Indian Ocean. 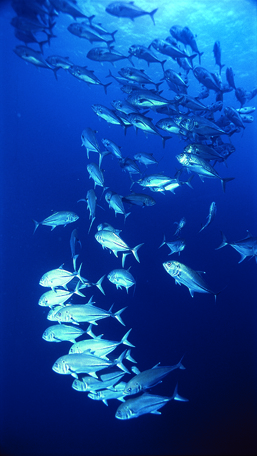 They pick the little fish that have the unfortunate idea of leaving their groups and make a feast. Measuring up to 1.20m, the puffer giant is the largest fish-moon. 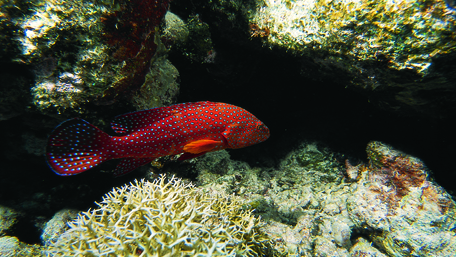 Despite its impressive measurements and its fierce predator look, this is a very shy fish, living alone in the quiet coral reefs. The starfish of Egyptian sea or gomophia egyptiaca with its five branches covered with conical horns, is a nocturnal marine animal and an invertebrate predator. 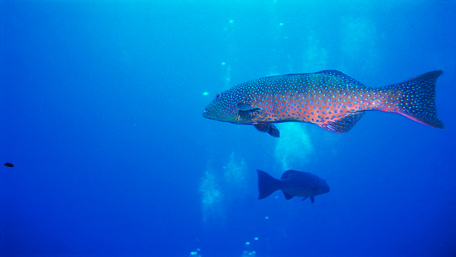 Two species of the family of red grouper: the Red Sea coral grouper and the coral grouper. Up to 1.10 m in length, these fish live solitary in coral reefs and underwater wrecks, feeding on crustaceans and different varieties of fish including eels. Sélicien fish of the genus Dasyatis, this viviparous ray has an extremely poisonous tail stinger. 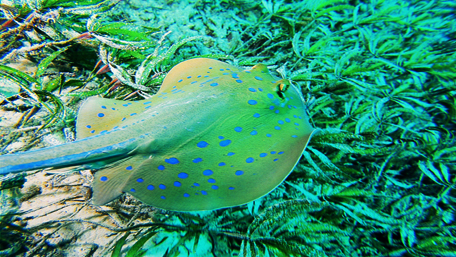 Blue spotted stingray one meter long, it enjoys itself with shrimps during the night, sea worms and crabs. 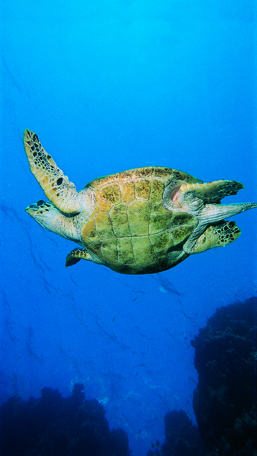 Hawksbill sea turtle, a veteran of the Red Sea. Older than the dinosaur, the sea turtle is endangered of all species and is listed on the IUCN Red List (International Union for Conservation of Nature). Leading cause of death: denaturalization of beaches where the females lay their eggs because of the hospitality and tourism development.